Yoga Breathing Really Does Help You Focus – Namaste! Response: Practitioners of yoga have claimed for some 2,500 years, that respiration influences the mind. In our study we looked for a neurophysiological link that could help explain these claims by measuring breathing, reaction time, and brain activity in a small area in the brainstem called the locus coeruleus. We chose to focus on the locus coeruleus because this area and the chemical it produces play intimate roles in both attention and respiration. Response: Chronic low back pain (cLBP) is prevalent among military veterans, but cLBP treatment options have limited benefits and side effects. This has resulted in efforts to reduce opioid use and embrace nonpharmacological pain treatments. Yoga has been shown to improve health outcomes and have few side effects in non-veteran community samples. Our objective was to study the effectiveness and safety of yoga for military veterans with chronic low back pain. In a study of 150 veterans with cLBP, we found that yoga participants had greater reductions in disability and pain than those receiving usual. Opioid medication use declined among all participants, and no serious side effects occurred. Response: The prevalence of stress urinary incontinence(SUI) is as high as 49% and varies according to the population studied and the definition of stress urinary incontinence. SUI causes psychological burden, affects relationships, lowers physical productivity, and decreases quality of life in women. Yet, few effective therapies are available for treating stress urinary incontinence. electroacupuncture vs 2.6 g with sham electroacupuncture, a significant difference. Response: Glaucoma is the leading cause of irreversible blindness in the United States and elevated intraocular pressure (IOP) is the most common known risk factor for glaucomatous damage. At the current time, IOP is the only modifiable risk factor for which treatment has a proven effect on preventing or slowing the progress of the disease. The story behind this study goes back to 1980, when we saw a 45-year-old woman with severe damage from normal-tension glaucoma, which then was thought to be a disease of the elderly and also thought to be rare, which we now realize was erroneous. The causes of normal-tension glaucoma were also poorly understood. It turned out on questioning that this particular patient had been performing yoga and standing on her head for 20 minutes a day for 20 years. We measured her IOP in this position and it rose from 15 mmHg in the sitting position to 60 mmHg. When measured lying flat, it was 30 mmHg. We measured everyone working in the department standing on their heads and the IOP roughly doubled in each of them. This was our first inkling that marked changes in IOP could result from changes in body position. The background for this study came from the lack of knowledge of IOP rises during yoga inversions, other than the headstand position. We looked at four common inverted yoga positions in glaucoma patients and healthy patients who were all experienced in practicing yoga. The four positions tested were downward facing dog, plow, legs up the wall, and forward bend. Each position showed a direct increase in IOP immediately assuming the yoga position, however the IOP dropped once assuming the seated position after two minutes in the yoga position. The most significant increase in IOP was seen during the downward facing dog position. 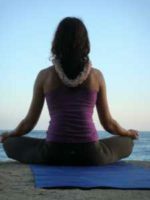 IOP of each study participant was taken seated (baseline), immediately assuming the yoga position, which was held for two minutes, again at the two minutes of the yoga position, immediately in the seated position following the yoga position, and again after 10 minutes in the seated position. Each position was tested once in this order of IOP measurements. Response: This study was borne out of a mutual interest in the effects of yoga and wellness in general between myself and my coauthors. ​We had heard and read about yoga’s effects on certain conditions like anxiety and pain, and we wanted to see if there was scientific evidence on yoga’s impact on measurable physiological cardiovascular ​outcomes. Dr. Gothe: The yoga group was speedier and more accurate on tests of information recall, mental flexibility and task-switching than it had been before the intervention. Participants in the yoga group showed significant improvements in working memory capacity, which involves continually updating and manipulating information. They were also able to perform the task at hand quickly and accurately, without getting distracted. Dr. Cramer: There is a number of randomized trials available on yoga for asthma. Based on those trials, there is evidence that yoga can improve asthma symptoms, asthma control, and pulmonary function in patients with asthma. However, yoga does not seem to be superior to sham procedures or breathing exercises and generally the evidence was quite weak. Yoga seems to be relatively safe in this patient population. Dr. Wolff: We investigated the effects of two yoga interventions on blood pressure and quality of life in patients in primary health care diagnosed with hypertension. Our study showed that a short yoga program practiced daily at home had an antihypertensive effect, as well as a positive effect on self-rated quality of life compared to controls. Answer: We found that when women took a 12-week yoga class and practiced yoga at home, they had significantly less insomnia than did women who did not. This was the only statistically significant finding in this MsFLASH (Menopause Strategies: Finding Lasting Answers for Symptoms and Health) Network randomized controlled trial. We also found that being in the yoga class did not decrease the number of hot flashes or night sweats. Yoga was linked to better sleep quality and less depression—but these effects were not statistically significant. In separate papers, published slightly earlier, our MsFLASH group reported that a non-yoga exercise program seemed linked to slightly improved sleep and less insomnia and depression—but these effects were not statistically significant. And an omega-3 (fish oil) supplement was not linked to any improvement in hot flashes, night sweats, sleep, or mood.